Many years ago, I was the turkey mascot for the National Home Brewing Association. One year for a shock effect at their national convention in Denver, I had to ride an elephant into a huge convention center room. Yes, I rode an elephant, named Stoney, in a turkey costume. According to Chazal, a Tamuldic sage, “When we are lucky enough to see an elephant we should bless God and say, “Blessed is the One who varies the creatures.” I was very blessed to not only see Stoney, but to have the privilege to ride him. Elephants are really unique creatures. Apart from being massively large and very smart, they are social, gentle, and loyal. Stoney was trained to kneel down almost laying flat on the ground so I could get on him. His gait was gentle and he lumbered slowly from side to side. I grabbed onto him to stay secure and felt the tiny stiff hairs all over his body. And social? He loved the attention he received from the awe-struck crowd. The flashing of cameras didn’t bother him at all and sometimes he would try to ‘hug’ with his trunk. Throughout history, elephants were used like military tanks in Asian warfare. Though they were not native to the Middle East, the Seleucids rode elephants to terrify the Jewish fighters during the Maccabean Revolt. “His [Antiochus’] army numbered a hundred thousand foot soldiers, twenty thousand cavalry, and thirty-two elephants trained for war” (1 Maccabees 6:30). “Each elephant was outfitted with a strong wooden tower, fastened to it by a harness; each tower held three soldiers who fought from it, besides the Indian driver” (1 Maccabees 6:37). “All who heard the noise of their numbers, the tramp of their marching, and the clanging of the arms, trembled; for the army was very great and strong” (1 Maccabees 6:41). 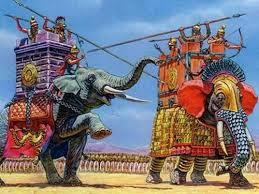 At this first encounter, Judah Maccabee and his men defeated 500 men and killed one elephant, but had to retreat. They were not expecting elephants in their battle plans. Perhaps it was at this time that the Maccabees began to say “stronger and smarter than an elephant” as they prepared for further military encounters with these massively strong and smart animals. Sometime later, “a Greek army of one hundred and ten thousand foot soldiers, fifty-three hundred cavalry, twenty-two elephants, and three hundred chariots armed with scythes” came to the Judean village of Moedin (2 Maccabees 13:2). At this second encounter Judah left “the outcome to the Creator of the world, and exhort[ed] his followers to fight nobly to death for the laws [Torah], the temple, the city, the country, and the government…. Giving his troops the battle cry “God’s Victory,” he made a night attack on the king’s pavilion with a picked force of the bravest young men and killed about two thousand in the camp. He also stabbed the lead elephant and its rider. Finally they withdrew in triumph, having filled the camp with terror and confusion. Day was just breaking when this was accomplished with the help and protection of the LORD” (2 Maccabees 13:14-17). There are those who say these elephant stories never happened or were embellished. Others say they were a metaphor for God’s Hand in the battles. Whatever is the truth, there is always that ‘elephant in the room’ that needs to be addressed – its loud voice. Let’s see what the Hebrew word pictures say. In Hebrew, elephant is Pil פיל. The individual letters symbolize “mouth, finished work, shepherd staff” suggesting to me that these mighty blessed elephants were God’s trumpeting mouthpiece prophesying the finished victory through the miraculous hand of the Shepherd of Israel bringing forth the restoration and re-dedication of His Temple in Jerusalem – Hanukkah. Miriam gazed at the flickering shadow in the room of the one oil lamp sitting on the bare wooden table. She could barely recall the story of Judah Maccabee and the desecration of the Temple a hundred years earlier that had been told to her by her grandparents and parents. This year, like the many years that had passed since she was a young girl, her heart recalled a personal miracle. Immediately she felt the Spirit of the Living God come upon her. It sweetly and gently touched and filled her womb. She knew that within her body a baby had been conceived. Gentle chills passed through her body as she remembered the breath of Elohim emanating through her womb consuming it with a holy life. She shivered again in the coldness of this winter evening. It felt like it would snow, but that rarely happened in the Galilee, only on Mt. Hermon. Her heart warmed with the memory of Yosef’s enduring devotion in the midst of the local scandal. Being pregnant and only betrothed made her appear to be a fornicator, a common whore. Yosef, who knew the truth and loved her deeply, remained faithful to her and believed her because he, too, had had a visit from an angel. Yes, she had witnessed his first miracle when he changed water into the most delicious wine at Solomon and Rachel’s wedding. The whole village of Kana couldn’t stop talking about the quality of that wine, even today Chava told Miriam she wished she had some of that delicious wine for the coming Shabbat. After he raised Lazarus from the dead, all of Isra’el seemed to be talking about her son. Some murmured about him while others wondered at his authority and followed him. For those in her own village of Nazareth, he was unable to do any miracles because of their unbelief. They had thrown him out of the synagogue and tried to push him off Mount Kedumim. She went around her simple home collecting several more lamps and filled them with oil. From the lamp on the table, she lit four lamps and they began burning brightly. The flames of two lamps lit her path as she walked toward the window holding one in each hand. As she placed them on the sill, she looked out over the countryside. The clear sky allowed the waning moon to shadow the hillsides in the Galilee all the way to the Temple so far away. As she turned from the window to retrieve the other two lamps from the table where their flames still burned brightly, a familiar voice echoed off the walls in the quiet room; the voice of her son teaching his younger brothers and sisters who always looked at him with wide eyes, open ears, and tender hearts. “My sheep listen to my voice. I recognize them, they follow me and I give them eternal life.” A smile crossed Miriam’s face as she could still see young Yakov’s upturned face reflecting the radiance of his older and wiser brother. The second time she and Yosef visited the Temple they thought they had lost their son in the crowds as Pesach, but they found him teaching in the Temple. To Yosef’s amazement, he had been instructing the rabbis with the same compassion and authority as he did his own siblings. She took two more burning lamps to the window sill. She still had two more to go. Tonight was the sixth night of the Feast of Dedication. Miriam spoke out loud breaking the quietness of the room, ‘My son and His Father are one.’ Perhaps tonight would be the night he would tell our people who he is. Perhaps he will finally reveal his identity to Isra’el. Suddenly, her thoughts frightened her. She wondered what would become of her son as he walked in Solomon’s Colonnade? Though he always imparted wisdom from his Father, the leaders were always anxious to rid themselves of him. She had heard rumors they wanted him dead, but could find no reason to pursue it. Would they find a reason tonight? Would they stone him as a blasphemer or follow him as the shepherd of the lost sheep of the house of Isra’el? Many Jews in Israel died by the sword in the days of Antiochus Epiphanes. Could it happen again? Now? Tonight? She shuddered as she carried the final two oil lamps to the window. She noticed that many of the village homes had oil lamps burning in their windows. It seemed as though they lit up the world with the reminder that Isra’el would always be victorious over their enemies. After she watched the flames of the village burn for several minutes, she walked across the room toward her rocking chair. It was made of twisted olive wood and was uniquely fashioned by the hands of her beloved Yosef. He had been such an honorable husband and a good father. She missed his tender heart and strong hands. She sat down and began to rock in the glow of the oil lamps. She could almost feel their warmth and her face reflected the presence of El Shaddai in her home. Shalom came to her heart with the warm luminesce of the flames and replaced the unwelcome fear with a song, “My soul magnifies Yahweh Elohim and my spirit rejoices in God, my yeshua. Once again, He takes notice of his servant woman in her humble position.” Comforted by the Spirit of Elohim, she knew nothing could take her from His hands. As she continued to rock, she gazed around the room where her children used to play with the wooden tops their father whittled for them when they were each old enough to spin one. Nun, gimel, hay and peh – a great miracle happened here. Everyone in Isra’el remembered the miraculous days of the Maccabees, but for Miriam the letters on the tops reminded her of her own personal miracle. She paused in her thoughts. For a long time she could only treasure in her heart the gift she had been given, the gift to birth the light of the world. Immediately after the angel’s visit, Miriam had gone to visit her cousin. The angel had told her that Elisheva, who was past childbearing years, was also expecting a baby. Their children would also be cousins! When she arrived in the Judean hill country where Elisheva and Zechariah lived, she knocked on the door never expecting to see Elisheva’s expanding belly or hear the words that still penetrated Miriam’s soul, “How blessed are you among women! And how blessed is the child in your womb!” Elisheva knew. Elisheva understood. For the next six months, they worshipped and blessed the Most High and His miracles to them. The lamps on the window sill burned for several hours until only one continued with its dwindling amount of oil. A miracle was happening now, in the present. Her son, no longer a child but the grown Son of the God, would fulfill Elohim’s promises to their forefather Abraham and his seed forever. Tonight in Jerusalem, her son walked in his Father’s house, the Temple. His ancestor, King David desired to build a house for Elohim, but was given the greater promise of an eternal kingdom. Her son was that promised seed, the evidence that the Kingdom had arrived. As the last lamp flickered out, Miriam continued to rock and closed her eyes in the darkness. Yeshua carried his Father’s name, the I Am. He was no ordinary son. She was favored to be his mother; he was the reason she dedicated her life and soul to embracing the words of the angel. They named him Yeshua, the name given to Yosef when the angel spoke with him. Her son is the Light of the world, the One who fills all lamps with oil. He is the miracle who is bringing the eternal kingdom into this world. And tonight, he would reveal his Father to Isra’el and Miriam knew that someday in the future a sword would pierce her heart. Hanukkah vs. Christmas, the Alternative? For many Biblical reasons, our family stopped celebrating Christmas many years ago. Our relatives didn’t understand our reasons, but accepted the decision as best they could. One side still sent Christmas presents that we reminded our children to accept with gratefulness because ‘every good and perfect gift comes down from the Father of lights” (James 1:17). The other side began wrapping Christmas gifts in Hanukkah paper. Though that was their way of respecting our decision, Hanukkah is not a Jewish substitute, replacement or alternative to Christmas. Hanukkah and Christmas have two very different historic backgrounds and have nothing in common with one another. The roots and traditions of Christmas can be found in the Roman celebration of Saturnalia on which the Catholic church sprinkled holy water, incorporated the birth of a non-Jewish Jesus, and created the Christ Mass (which ironically means ‘death sacrifice’). Those who embrace Christmas believing it as Jesus’ birthday are doing nothing more than acknowledging catholicism as the roots of their faith (even if they are protestants who reject everything catholic). In fact, all of Christiandom and secular society for this one day of the year become catholic in their celebration and promote the idolatrous Saturnalia with a holiday of stars, greenery, and gift giving. The events surrounding Hanukkah, the Festival of Dedication (John 10:22), are found in the Apocrypha and are rooted in Jewish history during the time of Alexander the Great when he wanted to Hellenize the world. It was during this time that the Emperor Hadrian changed the name of Judea to the Greek/Latin Palestine in order to expedite the destruction of the nation and people of Israel. Alexander’s cohort Antiochus Epiphanes (means ‘antichrist manifest’) went about ‘Palestine’ forcing the Jewish people to renounce their faith in the God of Israel or die. He sought to destroy the people and the lineage through whom the Messiah would come. They were not allowed to circumcise their children, celebrate Passover or any of God’s other holy days or offer sacrifices in the Temple. As Antiochus’ armies entered Jerusalem, they desecrated the Most Holy Place in the Temple with pig’s blood. This is the same Temple that today Muslim world leaders claim never existed; the same place where an Islamic mosque stands. Our family is not nor ever was catholic thus we do not take part in the Christ Mass. Our children were raised to understand the historical roots of Christmas and have never felt as if were missing something. Instead, they were taught about Hanukkah and the anti-semitism of the Greek/Roman world, the same anti-semitism that still exists today in much of the church due to its catholic heritage along with the growing ideology of hatred for Israel in the much-tolerated religion of Islam. As they are all grown and have their own lives, each still remembers the Maccabees and their fight to free the Jews from being Hellenized with paganism. They light their menorahs for eight days to remember the re-dedication of the Temple Altar back to Yahweh. Each night with the candle light they look forward to the day when the Messiah Yeshua returns, sets His feet on the Mount of Olives, enters the Eastern Gate of Jerusalem and the Temple area. On that day he will cleanse a newly-built Temple from the coming ‘abomination of desolation’ (Matthew 24:15-26, 2 Thessalonians 2:4). He will restore Jerusalem and the nation of Israel to the eternal glory that is promised in the Holy Scriptures. Hanukkah is not a Jewish alternative to Christmas. Changing the wrapping paper on a present or saying “Happy Hanukkah” rather than “Merry Christmas” changes nothing about the deeply rooted differences. One is a celebration with unBiblical roots and decorated to entice the world into idolatry; the other is a memorial to those who fought against anti-semitism in order to protect the Temple in Jerusalem and to stand against the destruction of their faith in the God of Israel. Unlike the Roman catholic-based Christmas, Hanukkah is a reminder from a century before the birth of Messiah that nothing and no one, especially a modern ‘antiochus’ can destroy the Lion of the Tribe of Judah through whom the redemption of the world will come. “What has been will be again; what has been done will be done again; there is nothing new under the sun” (Ecclesiastes 1:9). In the days of Judah Maccabee, there was an attack on the Jewish people by the Greeks. Not just on the Jewish people themselves, but on everything the God of Israel had given them and promised them in the Scriptures. Everything … Jewish. Historically, every king, emperor or leader who has done these things has been considered an enemy to Israel and the Jewish people. The Pharaoh of Egypt, Haman in Persia, Caligula and Nero of Rome, Miguel de Morillo and Juan de San Martin of the Spanish Inquisitions, and all the way to Hitler of the modern era set themselves up as gods and tried to snuff out the lives of God’s chosen people. Yet, there is still one more man of lawlessness to come, the one prophesied about in Daniel, spoken of by Yeshua, and explained by Paul. “The people of the ruler who will come will destroy the city and the sanctuary. … And at the temple he will set up an abomination that causes desolation, until the end that is decreed is poured out on him” (Daniel 9:26-27). “So when you see standing in the holy place ‘the abomination that causes desolation,’spoken of through the prophet Daniel—let the reader understand— then let those who are in Judea flee to the mountains” (Matthew 24:15-16). “Don’t let anyone deceive you in any way, for that day will not come until the rebellion occurs and the man of lawlessness is revealed, the man doomed to destruction. He will oppose and will exalt himself over everything that is called God or is worshiped, so that he sets himself up in God’s temple, proclaiming himself to be God” (2 Thessalonians 2:3-4). Today, the same deceptive battle rages. It could be called the modern Maccabean revolt because it is a rebellion against modern-day Greek and Roman ideologies that have created a religious system contrary to Biblical truth and its spiritual and historical foundations. This system teaches the Torah is nullified, the Temple is unnecessary, the Levitical priesthood is obsolete, the dietary laws are cancelled, circumcision is legalism, the Sabbath is changed, and the Jewish people are rejected by God. Everything … Jewish. These un-Biblical doctrines transform the God of the Holy Scriptures into an institutionally designed god. Jesus is misrepresented as a Greek-based Roman triune godhead rather than the King of the Jews, the Messiah of Israel. Many who could come to know Yeshua are driven away from a deeper walk of faith with God through these false and misguided teachings. Those who represent these teachings are not giving the world the good news of salvation; they are twisting the truth and giving the father of lies a platform on which to present his message of lawlessness and men transform themselves into the image of their own imaginings of ‘god’. This is nothing more than the work of the Adversary, the antichrist or man of lawlessness prophesied by Daniel, Yeshua, and Paul. There is nothing new under the heavens. There will always be lawless men who want to destroy the Jewish people along with their God-given Biblical heritage. There will also be men and women, Jews and gentiles, like Judah Maccabee and his father, who fight against such destruction and assimilation. These will place a Hanukkah menorah in their window to show the Jewish people they stand with them and the God of Israel. They will light the eight festive candles each night to proclaim to the world that they, along with the brothers and sisters of the Jewish Messiah, will never assimilate into a Hellenized Roman religious system that advances the coming man of lawlessness. The ancient Greeks didn’t win against the small Maccabean army; Antiochus Epiphanes didn’t destroy the Jews or the Torah they guarded for centuries. The modern-day Greeks won’t win against a royal priesthood that has begun to stand against the lies and deceptions established over the centuries by the church and church fathers. The modern-day Romans in Vatican City can’t stop the Torah from coming from Zion and the Word of the LORD from Jerusalem. The battle is the LORD’s and when the Messiah of Israel returns, all things will be restored and re-dedicated hanukkah to the LORD: the Torah’s teachings and instructions, the eternal Levitical priesthood, the seventh-day Sabbath as the covenant sign between God and His people, circumcision for entrance into the Sanctuary, and the Temple as envisioned by Ezekiel with a dedicated altar of sacrifice. Everything … Jewish.